Hey y'all! HAPPY NEW YEAR! I truly hope you enjoyed your time with your loved ones this holiday season! Congratulations to all of you winners for our 12 days of Christmas giveaways and THANK YOU to all you amazing vendors that participated! 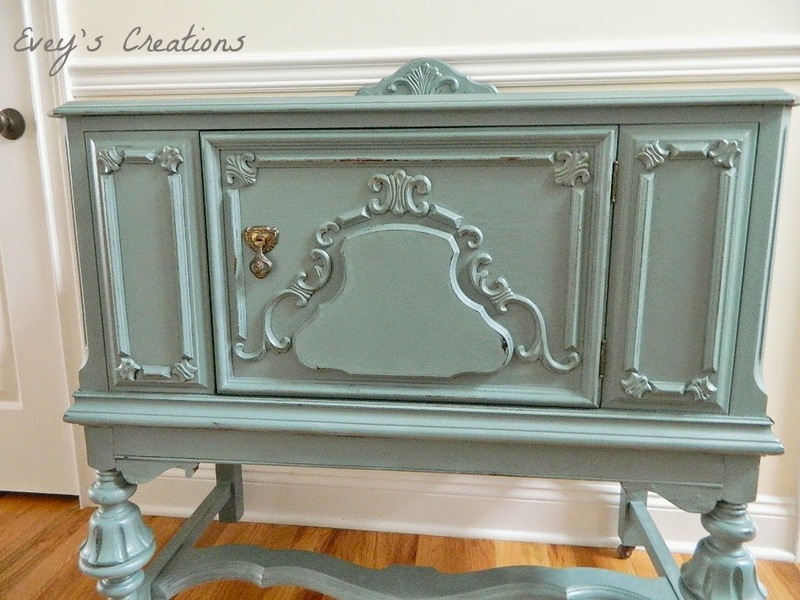 Today I wanted to bring you a tutorial on this lovely beauty I restored and refinished for a client just in time for Christmas! Her story is a good one! Though she was still lovely, she was a hot mess! You can't tell from the pictures, she had some structural issues that needed to be addressed. For starters, part of the right leg was missing the back part of that last spindle. Also, the veneer had seen better days and was starting to lift and warp on the top and one of the sides. Here's where it gets tricky. Since my workshop is very dark in the winter, and it's too close for me to open up the garage door, I don't have step by step photos like usual for this tutorial, but bear with me. I promise to explain it in full detail. First, I removed the veneer from the top using a damp towel and blow dryer. I hope to be getting a heat gun soon but in the meantime this is my trick! I get a towel damp and leave it on the top of the veneer I want to remove for a few hours. Then I finish the job using a blow dryer on high heat and the veneer peels right off! You can replace the veneer for the sides but it's not necessary. Veneer can be purchased at most big box home improvement stores and local lumber yards. Make sure you clamp well and use a good quality wood glue when replacing veneer. Sigh...isn't she dreamy!? Please note, the slight yet perfect distressing? She's gorgeous! 3 parts Aubusson Blue, 3 parts Chateau Grey, and 1 part Old White. 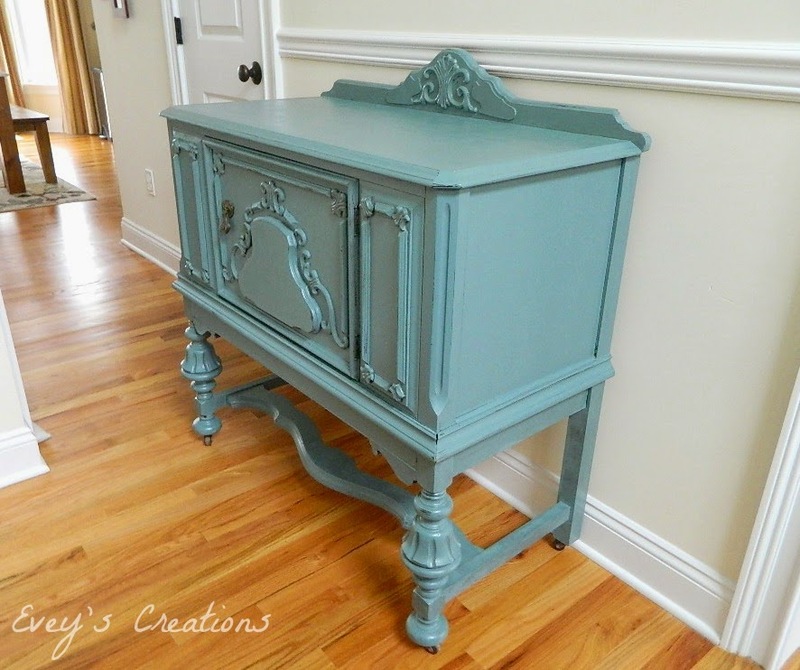 This color matched some textiles in the room where this sweet piece will live out her days. 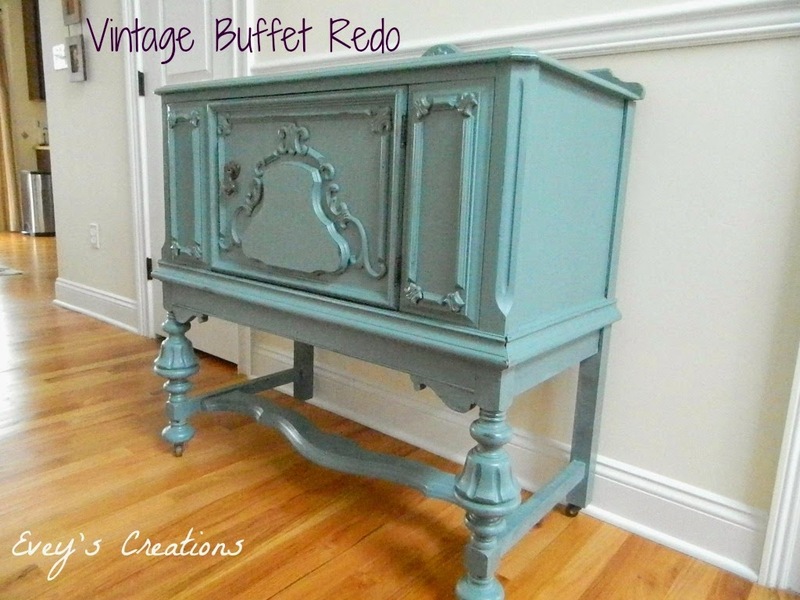 I decided to surprise my client and paint the inside of the buffet in Chateau Grey for a special two tone look when you open up the door! The best part about this doing piece was that it was a sentimental piece. Most of you that know me, know that there are pieces I WON'T paint, but I told my client that if she wasn't going to be selling this piece, due to the personal story attached to it, I would go along with painting it. 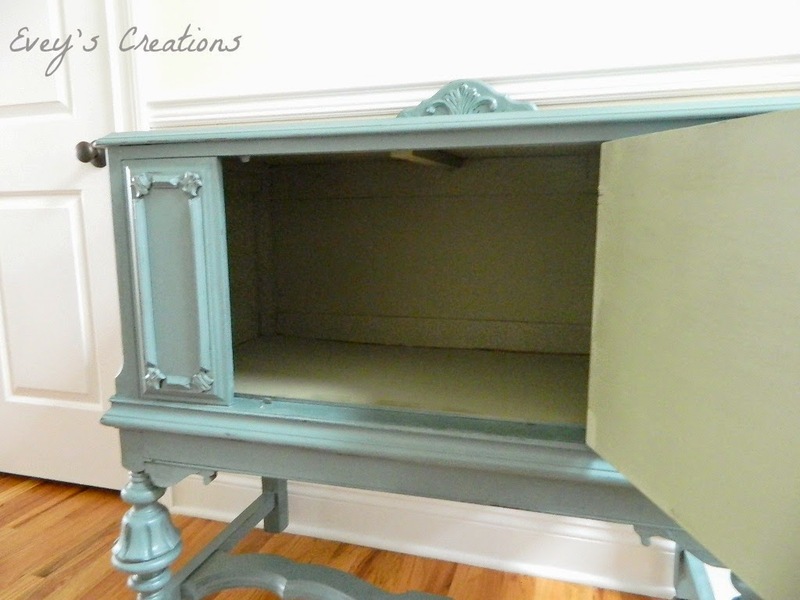 I have to tell you that I am SUPER pleased with the result and I would paint this baby again in a heat beat! :) My client extremely happy and that is ultimately ALL that matters to me! *This post contains Affiliate Links. For more info, check out our full disclosure at the bottom of our blog! She is stunning. You do beautiful work with such attention to detail. I am sure your client was very pleased with her heirloom piece. This is amazing!! I love the new color of it. 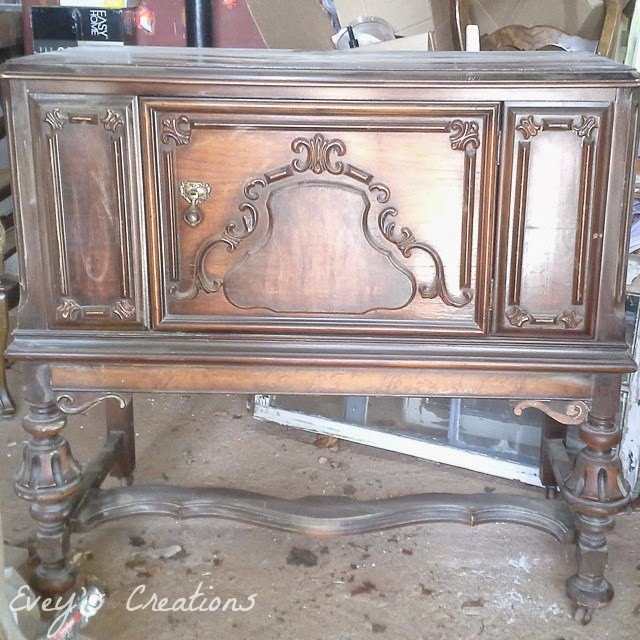 What a gorgeous piece to own!! Gorgeous! The color is perfect. That color is BEAUTIFUL. I love it.. just in time for spring! Gorgeous! I LOVE that blue. Might be borrowing your "recipe." Wow, great to know how to mold and replace broken bits! I had no clue! Love the color! Came out beautiful! LOVE the color , great job! Your surrounded by sweet talented friends. Tammy such a lovely Mason Jar Cloche! 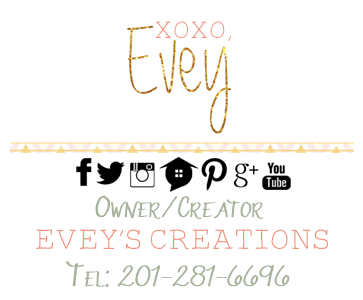 Thanks for the chance to win a present because Evey is having her birthday. You did an awesome job and I love the color!